These are all signs that your body is being weakened by excessive stress, and you need to take action! An interesting research article from America showed Acupuncture to lower stress and improve sleep in the elderly, which had the flow on effect of improving their immune system. In my Acupuncture clinic, worry and frustration are the 2 most common terms clients use to describe stress. Within Acupuncture theory, worry affects your Spleen and Heart, causing digestive and sleep symptoms. Frustration affects your liver, which can affect your diaphragm, emotions and menstrual cycle. This is why the symptoms can be so widespread. 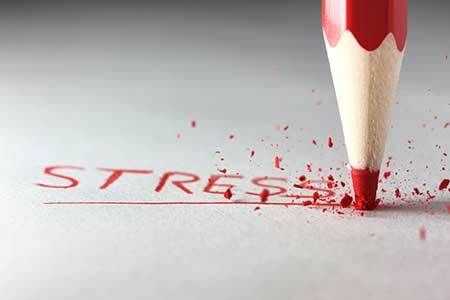 Once we have identified the root cause of your stress, we then work on rebalancing your Qi. Mind calming points are always included so I work on the acute symptoms, as well as the underlying cause within Chinese Medicine Theory. Often patients have other concerns such as neck pain or nausea which we will also discuss. I also discuss the importance of coping mechanisms, like yoga, running, martial arts, whatever helps you de-stress. I frequently see people internalise their worries and they get to a point where they feel like they will burst. I often suggest patients stay in close contact with their GP so they can work out plans for long term management. I can then do my best to provide further support to the process. I know this is much easier said than done, but everyone has some control over their lives, and you need to have strategies in place to ensure the stressful parts of your life don’t affect your health in the long term. Make sure you have hobbies and outlets – whether it be gym, yoga, tai chi or martial arts. Ensure you have an activity that helps you burn off your work worries. Get good quality sleep – a solid 7-hrs without waking and waking up refreshed. Good balanced diet – We are what we eat, which is why my clinic is focused on treating digestive health. A good diet means a strong immune system and helps you cope with stress.